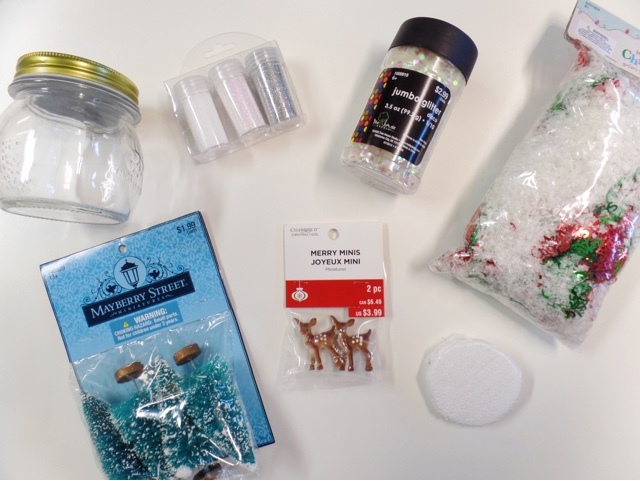 I've been really into home crafting recently and while I was on Pinterest one day I came across a photo of a DIY no water snow globe. I thought the idea was so neat and I wanted to create some of my own. 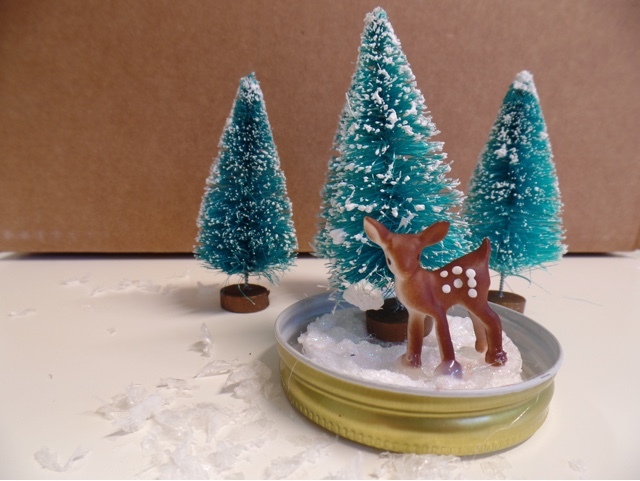 Creating this snow globe was incredibly easy and so much fun. I'm so happy with the way it turned out. 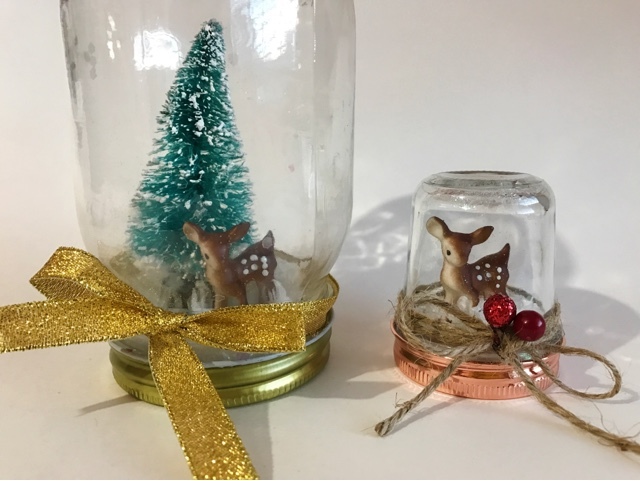 These snow globes have a very whimsical feel which I love and think they're so cute, of course you can always tailor them to your liking. 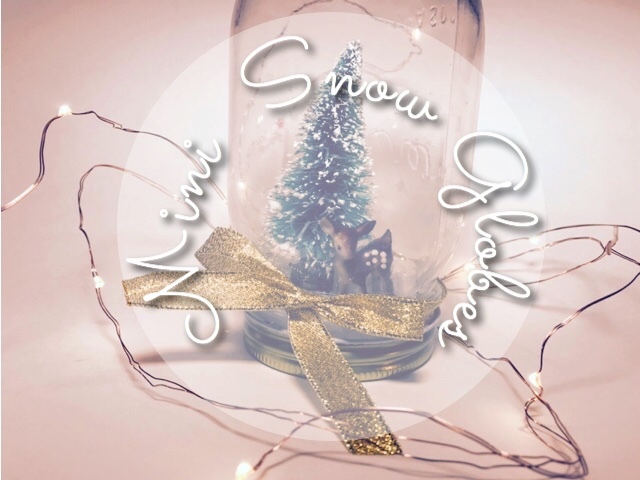 Here is how I created my no water snow globe. Quick heads up before we start. I used a hot glue gun to glue all my items down and at times I used a little too much glue causing things to become really messy and it melted the styrofoam. If you too plan on using a hot glue gun I'd advice you to use a small amount of glue also that there is a possibility that your figures may end up detaching if you shake your jar too hard. Step one attach your styrofoam to your lid, if you choose to not use some then completely skip this step. 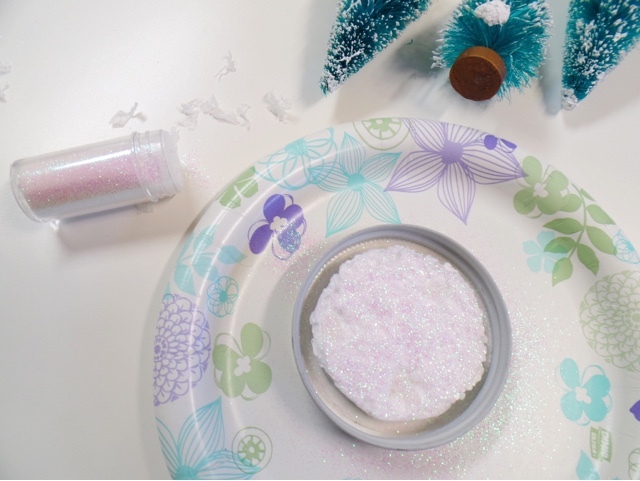 Once your styrofoam is glued apply a thin layer of any sort of glue you may have on your styrofoam (I used clear nail polish... ha ha) and sprinkle your glitter. Don't forget to tap off the excess. 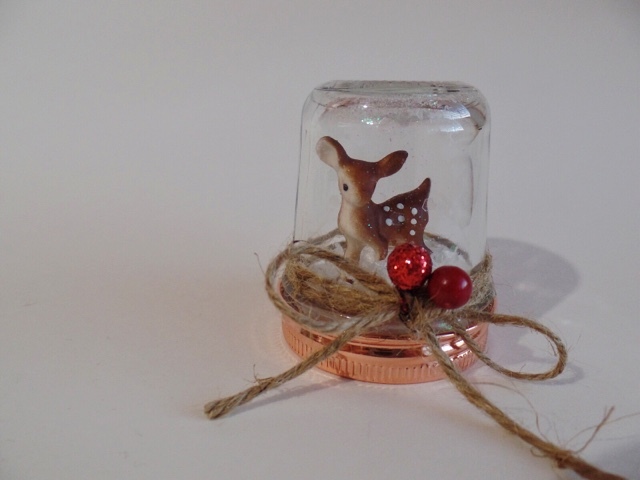 Now you can secure your figures; mini tree and deer ect. to the styrofoam using any adhesive of choice. 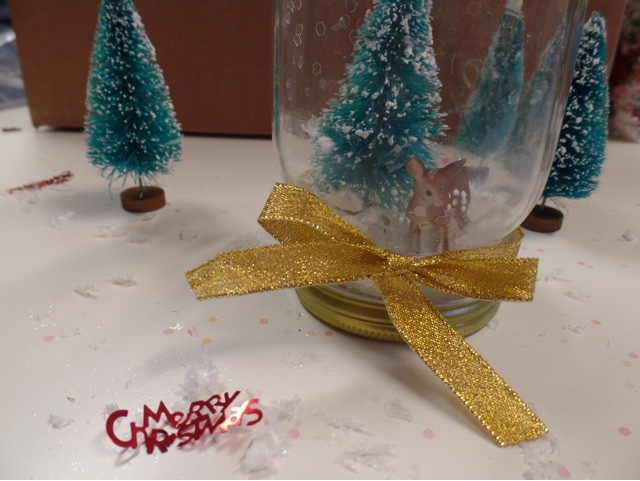 Add some snow and confetti looking glitter to your jar. Make sure not to add too much so that it doesn't cover up your deer. Tie your ribbon or twine to the lid making a bow at the front, and you're all done! Last minute I ended up making two different snow globes. For the smaller globe I used an mini candle jar from B&BW. I think they turned out very cute and they're each different in their own way. 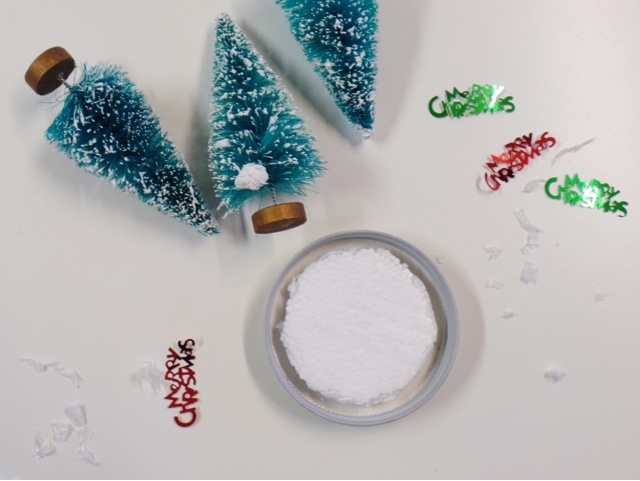 You should definitely give this DIY a try it was a lot of fun and it was so easy to do! Besides the complications with the hot glue. 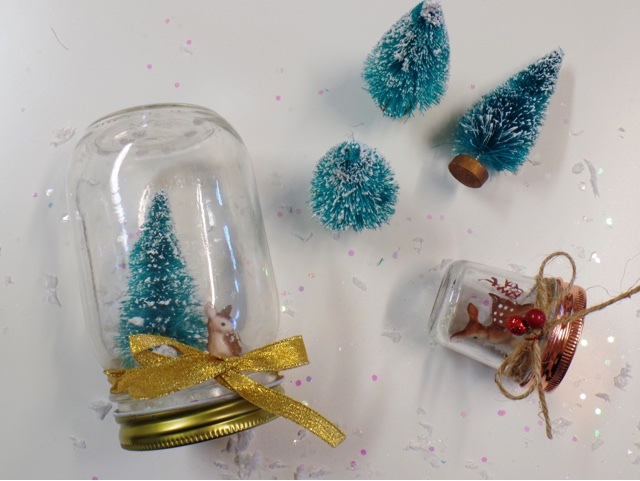 These snow globes truly are the cutest things to have displayed in your home and are the perfect addition to your Christmas decorations. I love the tiny one, I think the color of the lid makes it even cuter. That's what I loved about the mini jar! I want to make another! I love these I have to try making one. Its really easy to make you're going to have lots of fun.